Until now, network infrastructure stopped at the equipment and server level. As servers onboard more and more virtual machines, the network extends to the virtual machine itself and the hypervisor becomes a central software component processing all the traffic to virtual machines going through the hypervisor virtual switch. 6WIND Virtual Accelerator™ provides a solution that fulfills all the requirements to power the hypervisor with the required features for virtual networking infrastructures used in Network Function Virtualization (NFV), Data Center Virtualization or Network Appliance Virtualization use cases. 6WIND Virtual Accelerator provides a complete set of networking features including Linux and OVS switching, all kinds of overlays for multi-tenancy, L3 routing, VRF, ACLs, NAT, IPsec, QoS, TCP offloads and more. All these features are provided with the highest level of performance and the lowest latency using a DPDK-based implementation to build carrier-grade virtualized open architectures. 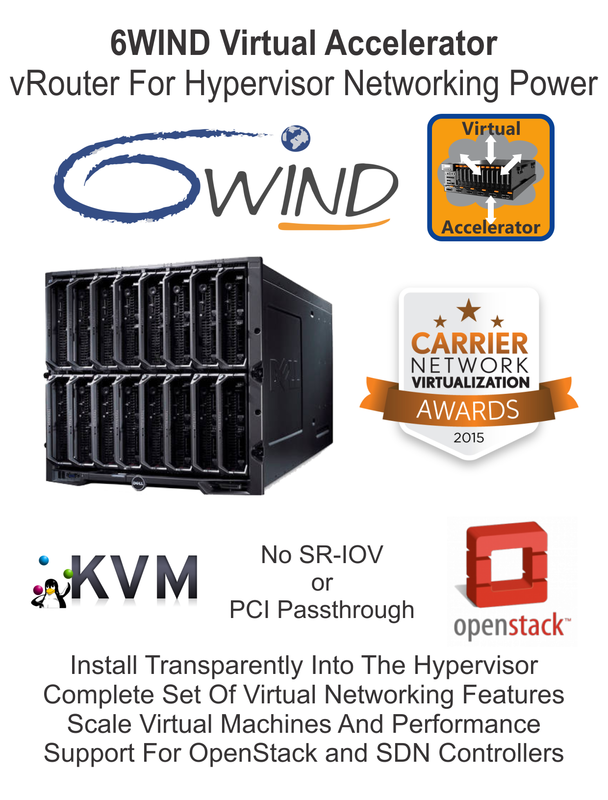 6WIND Virtual Accelerator software is installed on the KVM hypervisor to offer an alternative to SR-IOV or PCI passthrough that break virtualization. It easily integrates with the Linux kernel, OpenStack and SDN controllers as either the application or the management system keep on interfacing transparently with Linux.